Best friends Deborah Questelles of Fountain and Deborah Haywood of Belair will enjoy a trip to enjoy the 10th World Dominica Creole Festival from October 27-29. 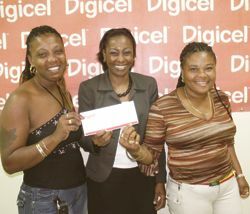 Questelles who got the call from Marketing Executive Juno DeRoche who informed her that she had won the trip said that she was ecstatic. She decided her friend of over 12 years Deborah Haywood was the person whom she would have the most fun with and the two homemakers said that they plan to just kick back and have a grand time. The pair will receive VIP passes to all the shows and free accommodations during their stay on the Nature Isle complements Digicel. Some of the big name acts scheduled to perform at the Dominica 10th World Creole Music Festival of which Digicel is a major sponsor include: Wyclef Jean, Shaggy and WCK.